Originally conceived as an email newsletter, CorkBuzz has grown into a three-unit wine bar and education center in New York City and Charlotte, North Carolina, since launching in November 2011. 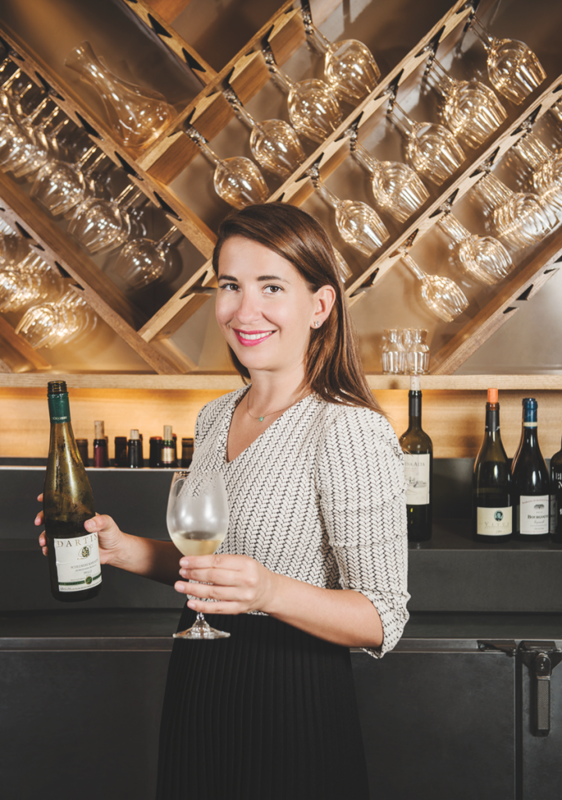 “I registered the name in 2004 and thought it would be a Daily Candy for the wine business,” explains cofounder and master sommelier Laura Maniec, who previously served as wine director at BR Guest Hospitality for six years. Maniec initially envisioned the yoga studio equivalent of a wine school. “You drop in and have amazing classes with different teachers at times that work for your schedule,” she says. “The classes aren’t necessarily testing or certifying you, but they’re providing in-depth information.” The wine bar component came after discussing the business plan with her uncle, CorkBuzz cofounder and COO Frank Vafier, and realizing there was an opportunity to create a venue where people can both learn and socialize. “The concept evolved from just a straight wine school to a meeting place where people discover their passion for wine,” Maniec notes. Between the two New York City locations—a 3,000-square-foot venue in Union Square and a 900-square-foot space in Chelsea Market—CorkBuzz offers 20 to 25 classes a month ($50 to $100 a person), depending on the season. “It’s a little slow in the summer, so we don’t have as many now,” Maniec says. “We’ll do a couple of Wine 101 classes and some food and wine pairing classes.” The number of students ranges from 15 at Chelsea Market to 32 at Union Square. In the fall, the Thanksgiving pairing class is so popular that CorkBuzz usually holds two sessions. Maniec also offers classes based on customer feedback and requests for regions like Napa Valley or the islands of Corsica and Santorini. In addition to Maniec and occasional guest instructors, CorkBuzz has three sommeliers who teach the classes. Private sessions and wine coaching are available as well. Maniec received her master sommelier certification in 2009, so she’s well-versed in all wine regions, but the Queens native is particularly knowledgeable in Champagne and Italian wines. For CorkBuzz, Maniec aims to combine recognizable tried-and-true producers from places like Napa Valley with esoteric discoveries, such as Txakoli rosé from Spain or dry Furmint from Tokaj in Hungary. “Our philosophy is rooted in being approachable, inviting and inclusive,” she says. CorkBuzz lists wine by style—white, red, orange and rosé, bubbly, and sweet—then by country or region, with sections dubbed “Old World Motley Cru” or “New World Motley Cru” for offbeat selections like the 2011 Kavaklidere Selection Narince from Turkey ($45 a 750-ml. bottle) or the 2012 Kanonkop Pinotage from South Africa ($75). By the glass, wines range from $10 for the Orleans Borbón Manzanilla Fino Sherry to $50 for the 2009 Marion Amarone della Valpolicella, served via Coravin. Bottles start at $38 for the 2013 Vincent Caillé Gros-Plant and go up to $1,995 for the 1990 Château Cheval Blanc. Maniec says top-selling wines include Pinot Noir from California or Oregon’s Willamette Valley, full-bodied reds like Malbec and Rioja, and refreshing unoaked whites, such as Grüner Veltliner and Loire Valley Chenin Blanc. CorkBuzz also sells a lot of Champagne, which is half off during Sunday brunch and after 10:00 p.m. daily, along with a significant amount of rosé in the summer. The two New York City locations attract slightly different customers. The flagship Union Square venue has more of a communal feel and gets a steady stream of regulars, while Chelsea Market appeals to a lunchtime crowd, shoppers and tourists. Wine flights ($26 to $49 for three 3-ounce pours) do particularly well at Chelsea Market, and both locations offer blind tasting flights for $15 on Mondays and Fridays. Wine dinners highlight winemakers, such as California’s Larry Turley and Germany’s Johannes Leitz, and the venues host large-format feasts like the CorkBuzz Clambakes during the summer. Overseen by culinary director and chef A.J. Schaller, the cuisine at CorkBuzz combines Mediterranean and American influences and changes five or six times a year, with seasonal tweaks. Entrées ($21 to $35) include such offerings as Atlantic cod with leeks, new potato and caviar beurre blanc and herb-crusted lamb rack with soft polenta, fava bean and vadouvan jus.